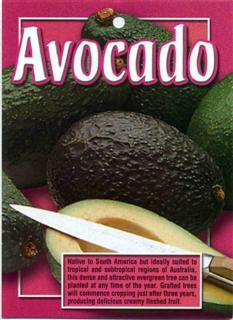 I am an amateur gardener in Victoria. I like to grow fruit trees specifically citrus and exotics where possible but any fruit or nut tree is likely to end up in my orchard. 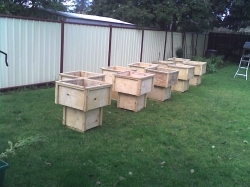 All my fruit trees are in large tubs and pruned to about 2- 2 1/2 meters high. This allows the mobility to change the selected site as conditions dictate, or if I decide to move house. Soil is worm free (worms are great in the normal garden but deplete the quantity of the soil in the tubs) and a mix of good free draining soil and lots of compost. I usually put in a good quantity of vermiculite which I find helps retain moisture at a good level over a period of time. I have a chipper/shredder and all the product from that gets mixed into the soil initially and then provides a mulch cover, reducing moisture loss and providing additional nutrients as it breaks down. Orchard to date boasts Strawberry Guava, Chilean Guava, Dwarf Peach, Pomello, Tahitian Lime, Arnold blood orange, Cherry, Fig, Blood Plum (Satsuma), lemon, Mandarin, Pepino, Nashi and a Bay Tree. Very interested in companion planting and aspects of permaculture. Don't believe that just one method on its own produces the desired results but a combination of methods to suit local area and conditions gives excellent results. Have had a great success growing herbs and chillies in pots. I use lotsof Chook Pooh (Dynamic Lifter is great but Elders sell a "Chook pooh" which is similar and at greatly reduced cost. Also use seasol or lately maxicrop as an additional supplement at flowering time. Use lime, blood and bone or other supplements for specific requirements only. Don't like using commercial sprays and insectacides prefering to use companion plants or home made concoctions which are usually better for the environment and made from ordinary "around the house" contents. Citrus have few problems and the exotics are doing well even though they are out of the usual climate. I put this down to better soil temperatures as a result of the tubs I use. 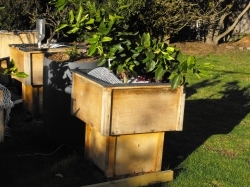 Fruit Trees in Tubs. My Avacado Bacon is in a 190 litre Olive drum. It was hit with 42 degrees and very low humidity last summer which burnt the new growth. The tree recovered and in fact has bushed out very well. Expect a crop this coming season. Soil is worm free and specifically mixed with plenty of body. 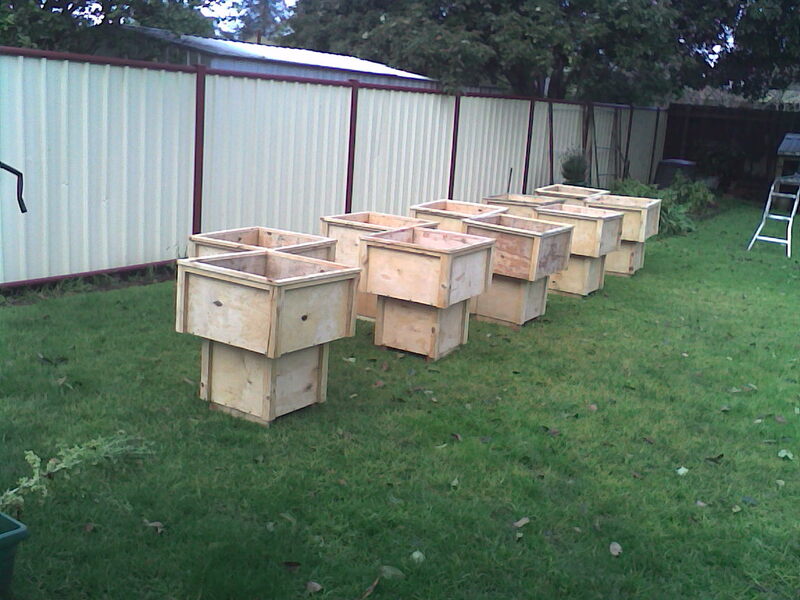 Fertilized twice per year with Chook pooh pellets and once a year with maxicrop. Top of tub is covered with a tree chip/shredded leaf mulch of about 2-3 inches. Have found that watering is required in summer about once a week (use a hygrometer moisture meter to check regularly). Very little watering if at all required during winter. Soil temperature is 13-18 degress during winter. Seems there is good warming properties from the tubs which are thick plastic. Have a tunnel contructed over all my fruit trees to protect from frosts in winter and the harsh hot/dry days we get in summer. Purchased a metalised frost material of about 50% shade value which works well. A little expensive but results worth it. Cover is removed when the frost or sun threat is over. 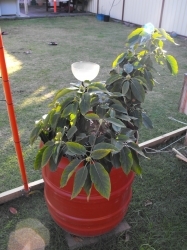 An excellent plant in top condition when received and a very heallthy plant now. Natural companion plants and home made pest liquids as an emergency when a hand is needed.